On the ninth and last day of Chaita Navratri, Shakti is worshipped in the form of Siddhidatri (Siddhi=perfection, Datri=giver). In iconography, She is depicted with four arms and holds a lotus, conch, gada (mace), and chakra, and She sits on top of a lotus flower. She governs the planetary body Ketu, which is the southern lunar node. When the Universal Mother was gripped with the idea of projecting Creation, She, first of all, created Lord Shiva who prayed to Her to endow him with perfections. For this purpose, the Universal Mother (Durgaa) produced Goddess Siddhidaatri from Her own person. As the behest of the Universal Mother, Goddess Siddidaatri bestowed eighteen kinds of rare perfections and powers and potentialities (Siddhis) on Lord Shiva. By virtue of these siddhis, Lord Shiva happened to develop a divine splendor. 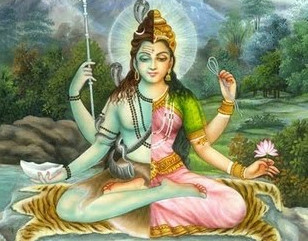 Having heard Lord Brahma, Mother Siddidaatri converted half the person of Lord Shiva into a woman. Thus Lord Shiva became half-male and half-female and came to be known as Ardhanaarishwara. Thus the problem of Lord Brahma was resolved and the task of the Creation went on smoothly. Goddess Siddhidatri who is worshipped by Siddha, Gandharva, Yaksh, Gods, Demons etc., holds Conch, Chakra, Gada and Lotus in her hands, giver of all siddhis and victory all over, be propitious to me. For purposes of pronunciation, I have included a link to the spoken mantra (The mantra itself lasts for the first minute of this video, after which a speaker gives a lecture in Hindi). She observed severe penance as Goddess Parvati to get earn Lord Siva as her husband. Once, Lord Shiva was rude to her by pointing out her dark complexion. 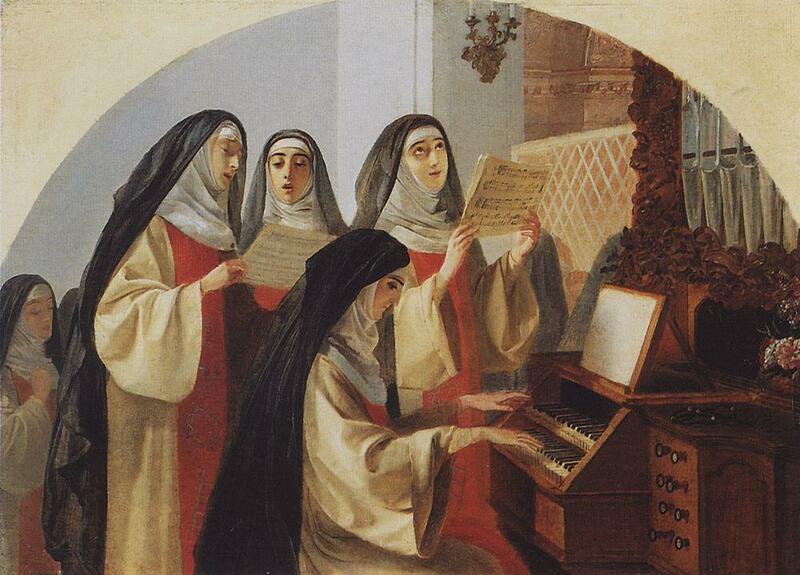 She started observing hard penance. This went on for over a thousand years. During this period her body got covered with soil. It became darker than ever. Then one day when Lord Shiva came looking for Mother. He was pleased with her penance. Thereafter he took Maa to the Ganges and bathed her lovingly. Mother regained her beauty with pure complexion and earned the name Maha Gauri. In this form Mahagauri represents purity and austerity. 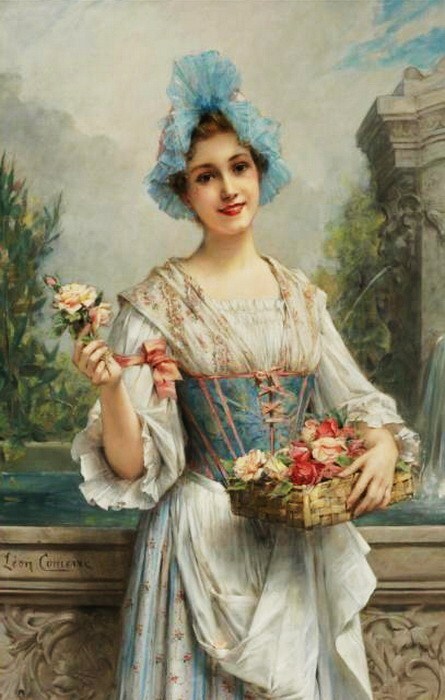 She scours and scrubs the filth from the souls of Her devotees and purifies their hearts. Both married and unmarried women especially worship Her on this day, as She is said to guide unmarried women in finding a good husband and She blesses married women with peaceful and harmonious marital lives. On the sacred occasion of Ashtami Pooja, Kanya Poojan (feeding of little girls) are also done to please Goddesses of Navdurga (nine forms of Durga). Nine little girls are invited at home of worshippers and are fed varieties of delicious sweet dishes. 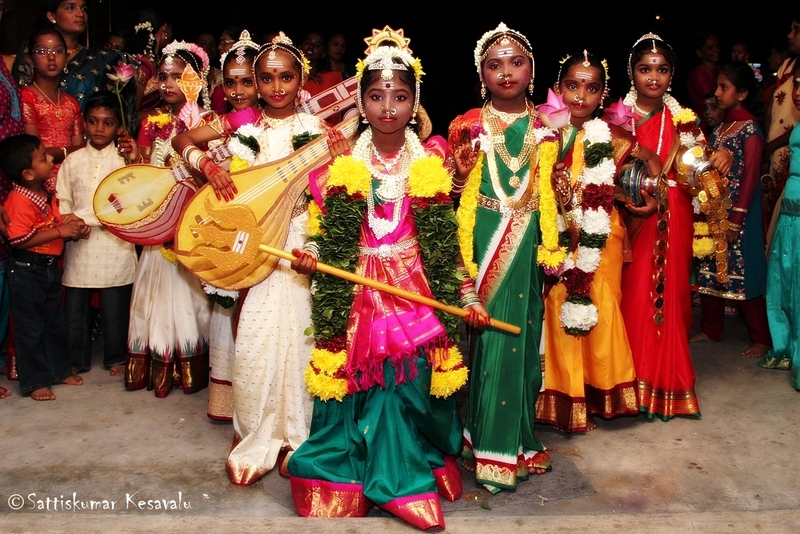 Devotees pay the best homage to nine little girls considering them nine forms of Navdurga. This ritual accomplishes their Pooja and gives blessings of Nav Durga. 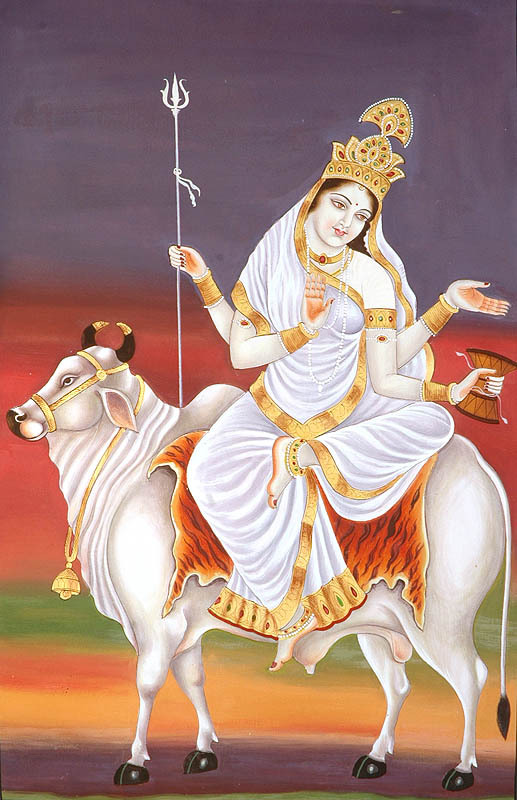 Goddess Mahagauri who rides on white bull, wear pure white clothes, giver of happiness, be propitious to me. For purposes of pronunciation, I have included a link to the spoken mantra (The mantra itself lasts for the first 35 seconds of this video, after which a speaker gives a lecture in Hindi). In this form Goddess Kalratri killed Raktabeej. Raktabeej was a demon who could multiply from every drop of his blood which fell on the ground. The Goddess Kaalratri killed him by licking the blood before it could reach the ground and hence conquered him. Kalaratri’s form is dreadful and repulsive in appearance (She is the most misunderstood of the Hindu Goddesses by many Westerners! ), but She is very protective of Her devotees and protects them against the evil spiritual influences of demons and dark forces. While She has a ferocious side, She also has a very maternal side. She also aids Her devotees to rid their lives of tamasic qualities, effectively destroying ignorance. She governs the planet Saturn and is associated with the Sahasrara (thousand, infinite) chakra, which is located on the crown of the head. It is the chakra of Pure Light and of Supreme Consciousness. Awakening the Sahasrara chakra leads to ultimate spiritual enlightenment. She is naked, rides on an donkey, has a long tongue, lustrous body, wears ornaments on her legs like lightning, is black in color, has unlocked hair, big eyes and ears and is very dangerous looking. Meditating on this form of Kalratri removes all obstacles as well as removes all magical effects created by others. 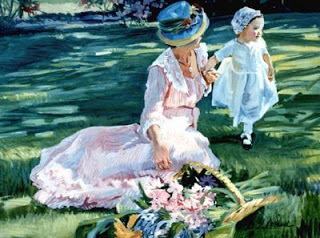 The legend behind her name goes thus: Once upon a time, there was a great sage called Kata, who had a son named Katya. Kata was very famous and renowned in the lineage of saints. He underwent long austerities and penance in order to receive the grace of the Mother Goddess. 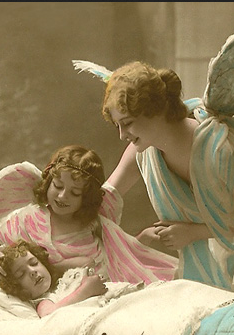 He wished to have a daughter in the form of a goddess. According to his wish and desire the Mother Goddess granted his request. Katyayani was born to Kata as an avatar of Durga. Katyayani rides atop a majestic lion and is (typically) depicted with four arms. In Her left hands She holds a sword and a lotus flower (symbolising blooming above the murk to achieve enlightenment); Her right hands are positioned in Abhaya( indicates for the devotee not to fear and is a symbol of protection) and Varada (symbolises the giving of blessings) mudras. In the Vamana Purana, She is depicted in Her fiercest form during the battle with the demon Mahishasura, whom She slays. Katyayani rules over the planet Jupiter. Her chakra is the most important of all chakras: the Ajna (command, knowledge, wisdom) chakra, or Third Eye. This is where the bridge between our human potential crosses into Divine Consciousness. Hindus also believe that spiritual energy from the outside world enters the conscious via this gateway chakra, and so they take great care in protecting this chakra through religious markings (made with holy ash, vermillion, etc.) on the third eye. She is commonly worshipped by unmarried women looking for a husband, and if a lady’s marriage is experiencing any delays Katyayani is often worshipped in order to remove the obstacles that are preventing the marriage from taking place. Devi Katyayani, who holds Chandrahaas Sword and other weapons in her ten hands, rides on Lion, and destroying demons, be propitious to me. On the fifth day of Chaitra Navratri, Shakti is worshipped in the form of Skanda Mata (Skanda=a Hindu God, Mata=Mother). Skanda Mata is a form of Parvati and as Her name implies, She is the mother of Skanda. She has four arms and holds lotus flowers (symbolising blooming above the murk to achieve enlightenment) in Her two upper hands. In Her right arm, She cradles Her Son Skanda and She keeps Her left hand in the Abhaya Mudra position (indicates for the devotee not to fear and is a symbol of protection). Skanda Mata is a Warrior Goddess, riding atop a lion and defeating the Asuras (demons). However, She carries no weapons. Like his Mother, Skanda is also a warrior. The Devas (gods) and Āsuras (demons) wanted to raise the treasure Amrita (the nectar of immortality), which was hidden in the depths of the ocean, to the surface. They used Mount Mandara as the stirring stick and the world serpent, Vāsuki, as the rope. The gods held the tail of the snake and the demons held its head. In this way they were able to churn the ocean of the world with their combined power. Numerous treasures and precious objects emerged from the ocean and, finally, the longed-for Amrita rose to the surface in a golden vessel. But the serpent they had used to churn the oceans spat out a deadly poison that was capable of destroying the whole earth. Quickly the Devas caught it in a bowl so it was not able to do any harm. But as they had absolutely no idea what to do with it or how they could permanently “dispose” of it, they turned to Lord Shiva for help. Lord Shiva is the most gracious of all the gods, and will never refuse a request from anyone. He took the bowl of poison and drank it down to the very last drop. However, in the process he did not swallow the poison but held it in the Vishuddhi Chakra and purified it by means of Ujjāyī Prānāyāma (a breath contorl technique used in yoga) and Jālandhara Bandha (a yoga position). In this way he rid the world of a deadly peril. Through the poison his throat was coloured dark blue, and since that day he has borne the nickname Nīlakantha (the blue-throated one). It is not just the external world that is extremely polluted, but also the psyche and consciousness of many people. For as long as the pernicious, toxic qualities of discord, rivalry, envy and resentment eat away at our mind, the light of God consciousness cannot shine through. Just as Lord Shiva neither spat the poison out, nor swallowed it, we should not swallow our problems as we harm ourselves through this; but we should also not spit them out as this can cause another type of damage. Like Lord Shiva, who purified the poison in his throat, we can also resolve our problems with the help of the Vishuddhi Chakra. Skanda Mata cares for Her devotees as Her own children and is often worshipped to remove obstacles from the devotee’s life. As Our Mother, She helps us to realise the poisons in our conscious and teaches us the best method in which to overcome these obstacles that hold us back from spiritual enlightenment. Skanda Mata, who rides upon a lion with Kartikeya (another name for Skanda), holds lotuses in Her two hands and Varmudra (the mudra of blessing) in one hand, be propituous to me. On the fourth day of Chaitra Navratri, Shakti is worshipped in the form of Kushmanda (Ku=little, ushma=warmth, anda=egg). Symbolically, Her name means “that is from whose fraction of warmth the universe has been emanated,” designating Her as the comic egg which created the Universe and hence a Creator Goddess. Parvati takes on the form of Kushmanda after She started living inside the core of the Sun to liberate energy to the rest of the Universe. As a solar Goddess, Her governing planetary body is the Sun. This goes back to Her role as a Creator, for in the beginning the Universe was nothing more but a void of darkness until Her light spread in all directions. Her mount is a lion and She is depicted with eight arms in iconography. She holds a kamandal (an oblong water pot carried by ascetics), dhanush (bow), arrow, and lotus flower (symbolising blooming above the murk to achieve enlightenment) in Her right hands, and in Her left hands She carries a kalasha (a metal pot with a large base and small mouth), Japa mala beads (prayer beads), gada (a blunt mace/club), and a chakra (a disc-like weapon). Kushmanda bestows brightness, clarity, and peace upon Her worshippers. What does this tiny room in the heart of the Lotus mean? It is the Ātmā, our true Self. The Ātmā is a part of God. It is pure, unchanging, Infinite Consciousness. It is Eternal, Unborn and Immortal, and exists in every living being. Just as the whole tree is already contained and present within a seed, the essence of the entire cosmos exists in the centre of the Heart Chakra. In meditation, as soon as the sadhak (someone who follows a way of life in order to achieve Nirvana) invokes her, her bell immediately become active and starts ringing to protect the devotee under her shelter. The crescent moon is symbolic of feminine energy. It is also associated with clairvoyance and knowing without thinking. The crescent also represents illumination,new beginnings and making dreams a reality. It is connected to rebirths and how our true essence really is immortal. That is why she is called ‘Chandraghanta’. Her ornaments are rich and signify material comfort. Chandraghanta’s mount is a tigress and is depicted with ten arms. She holds a trishul (trident), gada (a blunt mace/club), sword, and kamandal (an oblong water pot carried by ascetics) in her four left hands and keeps the fifth left hand in the Varada Mudra positition (symbolises the giving of blessings). In Her right hands She carries the lotus flower (symbolising blooming above the murk to achieve enlightenment), dhanush (bow), arrow, and Japa mala (prayer beads) while keeping Her fifth hand in the Abhaya Mudra position (indicates for the devotee to not fear and a symbol of protection). She governs the planet Venus. Goddess Chandraghanta is the representation of Supreme bliss and knowledge. It is said that by Her blessings, all the sins, sufferings, bad energies etc are eliminated from Her devotees’ life. By riding a tiger She inspires Her devotees to be fearless. By worshipping Goddess Chandraghanta one gets rid of all the worldly sorrows and attains supreme spiritual bliss. O Goddess Chandraghanta, who rides on Tiger, angry on enemies, holds many weapons in ten hands, be propitious to me. On the second day of Chaitra Navratri, Sri Durga is worshipped in the form of Brahmacharini (Brahma=penance, charini=performer). She does not ride upon a mount but rather walks upon bare feet, carrying a Japa Mala (Hindu prayer beads) in one hand and a kamandal (an oblong pot used for storing drinking water that is carried by ascetics as a symbol of a simple life) in the other. She governs the planet Mars. Brahmacharini is a Goddess of simplicity and appreciates simple devotions. During her puja (ritual) on the second day of Chaitra Navratri, She is offered flowers, rice, and sandalwood. She showed a keen interest in Shiva from the outset, repeating his name to herself and taking delight in hearing about his appearance and deeds. While she is a child a sage comes to her house and after examining the marks on her body predicts that she will marry a naked yogi. When it becomes clear that she is destined to marry Shiva, her parents are usually described as feeling honored. Parvati too is delighted…Steadfast in her devotion, Parvati persists in her quest to win Shiva as her husband by setting out to perform austerities. One of the most effective ways to achieve what a person wants in traditional Hinduism is to perform tapas, “ascetic austerities.” If one is persistent and heroic enough, one will generate so much heat that the gods will be forced to grant the ascetic his or her wish in order to save themselves and the world from being scorched. Parvati’s method of winning Shiva is thus a common approach to fulfilling one’s desires. It is also appropriate, however, in terms of demonstrating to Shiva that she can compete with him in his own realm, that she has the inner resources, control, and fortitude to cut herself off from the world and completely master her physical needs. By performing tapas, Parvati abandons the world of the householder and enters the realm of the world renouncer, namely Shiva’s world. 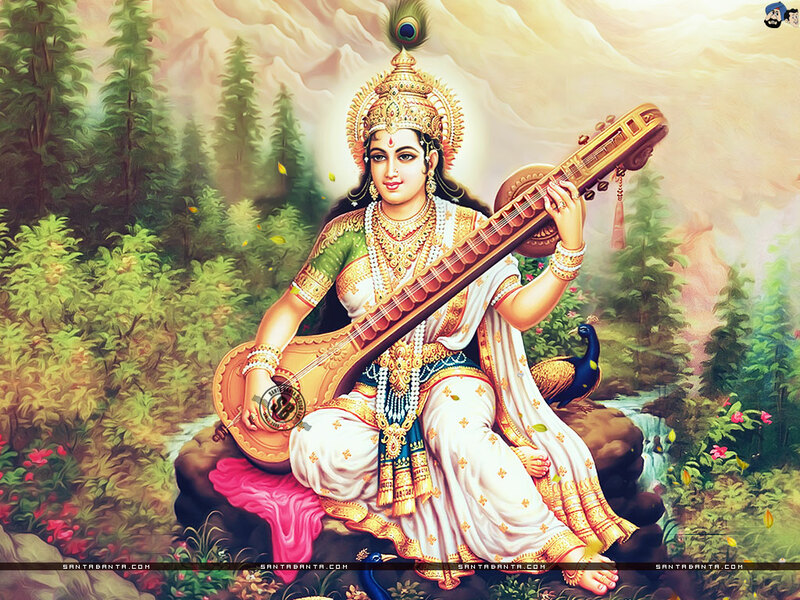 Most versions of the myth describe her as outdoing all the great sages in her austerities. She performs all the traditional mortifications, such as sitting in the midst of four fires in the middle of summer, remaining exposed to the elements during the rainy season and during the winter, living on leaves or air only, standing on one leg for years, and so on. Eventually she accumulates so much heat that the gods are made uncomfortable and persuade Shiva to grant Parvati’s wish, so that she will cease her efforts. The marriage is duly arranged and elaborately undertaken. Brahmachandri is also associated with the Swadhistana (Sva=Self, Adhisthana=seat, residence) chakra. This chakra is about three centimeters above the Muladhara chakra between the coccyx and sacrum. It is said that in previous eras the Kundalini Shakti resided in this chakra which is the sear of the subconscious, but during our Kali Yuga age of spiritual ignorance it moved further downward into the unconscious Muladhara chakra. The one who carries the flower of Lotus, Rudraksha Mala and stoup in one hand. The sublime Goddess Brahmcharini, please bless me. For readers who are unfamilar with Hindu culture and celebrations, a very brief introduction to this nine-day festival of the Goddess is an essential foundation upon which to build this series of articles on the different forms of Shakti worshipped during this festival. 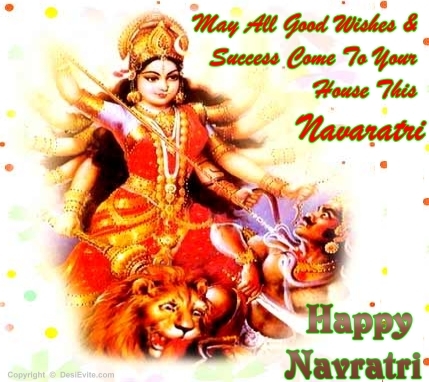 Navratri is a festival that is celebrated five times a year, but the most important two are the ones in the spring (Chaitra Navratri, Vasanta Navratri) and in the autumn (Sharada Navratri). Chaitra is the first month on the Hindu calendar, and the word Navratri itself literally means “nine nights” in Sanskrit. This year, Chaitra Navratri will be celebrated from March 31-April 7. There are several legends associated with the celebration of Navratri, but the most famous is the tale of Sri Durga slaying the demon Mahishasura. The battle between the demon and Goddess lasted for nine days, and on the end of the ninth night Sri Durga finally killed him. During Chaitra Navratri, a lamp is kept lighted at all times for the duration of the festival. A ritual called Ghatasthapana (ghata meaning “vessel” and sthapana meaning “to establish) is performed on the first day, in which the kalash (holy water vessel) symbolising Sri Durga is placed in the prayer room. The kalash is covered in cow dung and barley seeds are planted inside of the kalash. The sowing of the barley seeds symbolises growth, prosperity, abundance, and fertility. Fasting is also a common practice during Chaitra Navratri. Meat, alcohol, grains, onion, and garlic are all avoided during this time. Every evening during Navratri, the Durga Suktum is chanted in honour of Shakti. On the eigth and ninth days of Navratri, Yagna is performed in honour of Sri Durga and to bid her farewell. On these last days, Kanya Puja is also performed in which nine young girls representing the nine forms of Shakti are worshipped. Each day has a governing Goddess who is the focus of the daily devotions. The following series discusses these nine Goddesses and their worship during Chaitra Navratri. Sri Durga is glorified on the first day of Navratri through Her form, Shailputri (Shail=mountain, putri=daughter). She is the Absolute Form of Mother Nature and watches over every living thing and encourages humans to live in harmony with Nature. She is also a form of the Goddess Parvati and Her consort is Shiva. She holds a lotus in Her left hand and a Trishul (trident) in Her right hand. Her mount is Nandi, a bull. Durga’s slaying of the demons as per Purana stories has important lessons for the spiritually minded . Durga is a very important feminine form of divinity, especially for personal transformation from our lower or animal nature to our higher spiritual nature. These are all symbolical. Heaven is our own mind. The demon is our lower nature. And the demon in heaven is our own inability to control our own mind. By slaying them, she has torn down ego. In reality, this is a common challenge for most people, so one can see the relevance of the story and importance of Durga. As Durga represents transformation through elevation in consciousness, we call on Durga to transform and elevate our minds. Durga as a goddess is a feminine form and therefore the divine mother, but she also has a form that relates to the earth – Shaila Putri. 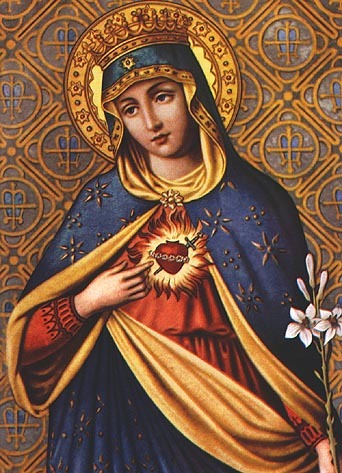 Her birth connections to the mountains are indicative of the sacredness of the mountains and their important connections to the earth. Goddess Shaila Putri is also strongly associated with the waters and air as well, as the waters represent the flow of consciousness, cleansing and purity. Salute the Mother Goddess who has a half moon on Her forehead, who rides a bull and holds a trident. We chant your name and praiseyou always Maa Shailputri.